Did I tell you? I gave up cheese. Cheese! I do eat a little goat cheese and fat free feta, but otherwise everything else is cut out. I had a serious cheese problem. Ask James. He would tell you I spent at least $25 a week on fancy cheeses, shredded cheese and sliced cheese. I ate it as dessert. I ate it with every meal. I ate it when I was bored, hungry, tired… Cheese was my savior. And then after consuming a huge plate of cheese, I had a realization – this isn’t making me feel any better. So I gave up cheese. I feel amazing. I miss it, yes, but that’s why I’m allowed the random moments of goat cheese crumbles and feta. Neither of which you can find on a gluten free pizza anywhere in town. And as I mentioned in a previous post, it’s too hot to turn the oven on. I wanted to make pizza on the grill, but how can one do that with gluten free pizza dough?! Oh, I will tell you. To avoid massive heat, you can use a toaster oven for the first part. If not, make your crust in the morning when the heat won’t overcome the household. I used a recipe adapted from Gluten Free on a Shoestring. Apparently you can make pita pockets from this too! Preheat your oven to 400 F. Mix the flour blend, xantham gum, baking power and salt in a stand mixer. Add the oil, eggs and milk and mix to combine. I used the paddle attachment for this. For the water, add slowly while the mixer is still on and stop once a ball comes together and the dough is not overly sticky. Remove from mixer and divide dough into 3 equal portions. Oil a pizza stone (or a smaller tray for your toaster oven). For each dough portion, wet your hands and smooth down so that it’s 1/4 – 1/2 inch thick. Bake for 8 minutes, flip, and bake for another 8 minutes. Let cool. For the pizza part of this, when you’re ready, add your toppings. 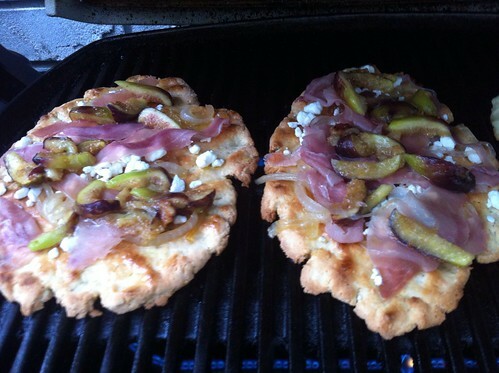 In my case, I made caramelized onions and figs, shredded prosciutto and sprinkled goat cheese crumbles on top. Preheat your grill and oil the grate. Slide your topped pizza carefully onto the grill, and close. Let cook for 5 – 7 minutes, until everything is heated through and your crust has grill marks. I added a balsamic drizzle on mine to finish it off. I know. It’s been a long time. I have been going through a lull. I don’t want to cook anything new. It’s hot outside so turning on the oven is impractical. Telling you how to grill a hamburger is silly. 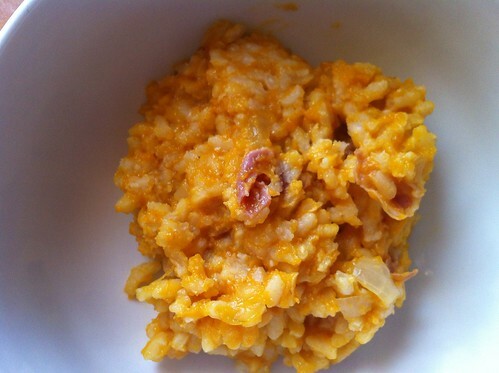 But I had a dream that I made cantaloupe & prosciutto risotto and I couldn’t get it out of my mind. It was fate. I had to cook again! This turned out to be surprisingly delicious, but a little heavy for a summer dish. In retrospect, I would also add more prosciutto to bump up the salt factor and swap out the vegetable broth for chicken. But overall, it was pretty amazing. You may be asking, how the hell do I grate a cantaloupe? I know. I wouldn’t want to either. So this recipe works best if you have a food processor and access to the right blade. Alternatively, if you don’t have a food processor, I recommend removing the seeds and rind from half a cantaloupe and blending it in batches. The end result doesn’t have any distinguishable pieces of cantaloupe in it so you won’t be missing much. First thing first, as with all risottos, bring your broth (and in this case broth + water) in a medium size saucepan to a simmer. Prep the onion, garlic and cantaloupe. Heat olive oil in a large saucepan and add the onion, cooking for two minutes. Add the garlic and stir for 30 seconds, then add the cantaloupe. Stir frequently until the liquid thickens up (takes two to three minutes). Add your arborio rice, stir and let soak in the goodness for about a minute. Add the wine, continuing to stir until absorbed. Then add the broth by 1/2 cupfuls, stirring frequently until the broth has been absorbed. Do this until you’ve used up all the broth and the rice is tender. Remove from the heat and add your prosciutto. Let sit for at least 10 minutes before serving. For the past month I’ve been making smoothies for breakfast. This isn’t anything totally new in my routine, but up until very recently I was super reliant on protein powder. This is great when you’re in a pinch for a FAST high protein meal, but let’s face it, it’s not very natural, full of sugar and fillers and calories. So I wanted to try something new, something healthier and more natural. Combine all ingredients together in a blender and blend until smooth. Eating at gatherings oftentimes means bringing your own food. It’s just the nature that goes with the GF beast. So for a St. Patrick’s Day feast at a friends, I brought my own shamrock inspired GF pizza and probably the healthiest dessert I’ve ever made. But they were delicious, and I don’t care what anyone says! In a food processor, or in a large bowl, combine the almond meal, cocoa and salt together. Add the agave and vanilla and mix well until a ball forms. For a no mess, easy clean up, line a cookie sheet with parchment or wax paper. Roll 1-inch balls, then gently flatten. You need sets of two so if you have any leftovers, eat it! 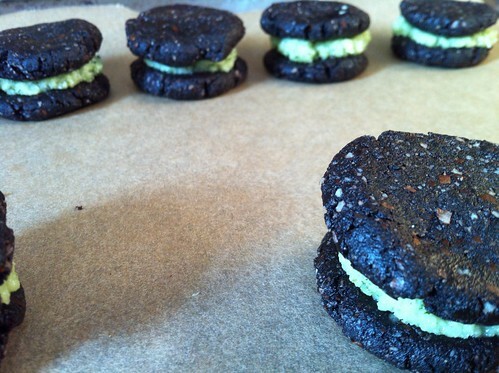 Place the flattened balls on the cookie sheet and pop into the fridge while you make the filling. In a food processor (yes you really need one now), combine the above ingredients until a butter / paste forms. 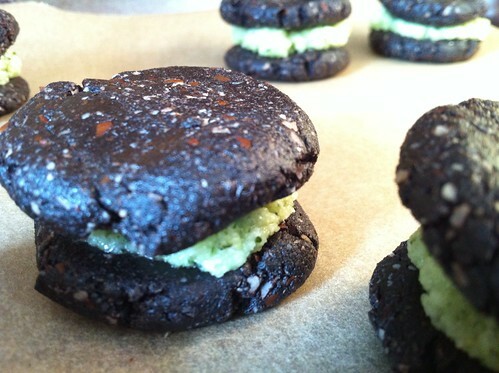 Using a butter knife, spread about 1 tsp on each cookie, then press cookies together, frosting side in the middle. My goodness, has it really been two months?! A lot has happened. James proposed. We’re planning a wedding. I’ve watched almost three seasons of Big Love. I’ve been cooking with gluten free pasta from Italy. Anyway, this week I have been battling a horrible cold. My entire head feels like a balloon is inside ready to swell and pop. So I’ve been eating a lot of soup. Lentil soup. Pumpkin bisque soup. Chicken soup. Tonight I could eat no more soup. That means pasta. And I decided rather than oil and cheese, or marinara sauce, I’d try and make an Alfredo sauce. In a saucepan, heat olive oil and add the roasted red peppers. Stir quickly, then add the heavy cream and lower heat to barely a flame. Add the cheeses, garlic powder and pepper. Let melt together, stirring occasionally for 10 minutes or so. 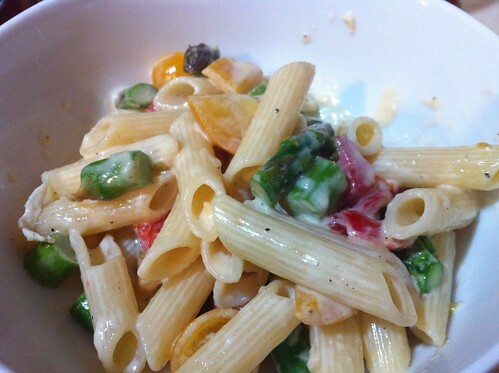 Toss with pasta and fresh vegetables. I’m back! The holidays were a whirlwind of excitement, travel and TONS and TONS of food. January 1 I started counting calories again. January 4 and January 5 were completely shot as I filled my face with food. Oops. I made the best roast ever for our Christmas Eve dinner. This roast was a project. Not because it’s a difficult recipe, but because we could not find said roast in the store for a reasonable price. 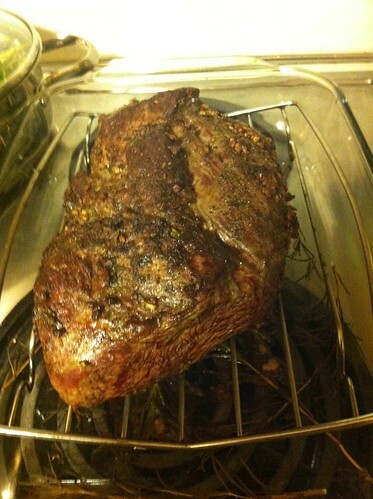 Bon Appetit recommended a three pound center cut tenderloin roast. The first place we went to find the roast it was $40 PER POUND. The next place, it was $20 per pound. Finally, god bless Market Basket, we found it for $15 a pound. And thankfully my mom went into Market Basket to buy it because I have a serious phobia when it comes to that store. So. many. people. If the blog “People of Market Basket” doesn’t exist yet, someone should start it. There are some serious characters. The morning of, combine the garlic, thyme, salt, black pepper and pink pepper. Remove the roast from its packaging and have a few pieces of plastic wrap ready on the table (you’ll be rewrapping the roast, so cut accordingly). 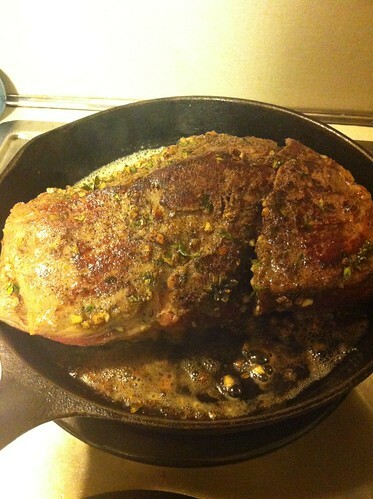 Rinse the roast, pat dry and then rub the garlic mixture on all sides. Rewrap in plastic wrap and pop into the fridge to soak in the flavors for a few hours. One hour before you plan to begin cooking, remove roast from the fridge and let come down to room temperature. This is critical. Preheat the oven to 400F. Scatter rosemary on the bottom of your roasting pan. Melt the butter and olive oil together in a cast iron skillet and sear the roast on all sides. I did this on an electric stove, and it took about 10 minutes. This most likely takes less time on a gas stove. Transfer the meat to the pan and roast for about 30 minutes or until your meat thermometer registers 125 for a medium-rare. Let the roast sit for 15 minutes before slicing. NOTE – for some reason, 140 produced a very rare roast, so I sliced it up, popped it onto a cookie sheet, and let cook for another 5 minutes in the oven. It was perfect. Guys. Seriously. 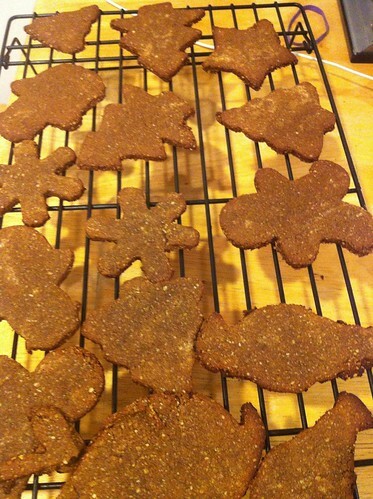 There is no recipe out there for paleo nut free gingerbread cookies. I was in shock. Really?! No one has ever done this?! Someone must have. But I couldn’t find their recipe. And I barely have gluten free baking down, let alone grain free baking. It’s a whole new world. Preheat oven to 350F. In a food processor, pulse your sunflower seeds into a coarse flour. Transfer to a large mixing bowl. Next, pulse your peptias into a coarse flour. Transfer to the same bowl. Add the coconut flour, cinnamon, nutmeg, salt and baking soda. Stir to combine. On the stove, heat 1/2 cup of molasses until it boils. Remove from the heat and add the maple syrup and coconut oil. Stir until everything is combined (and melted if your coconut oil wasn’t already melted beforehand). Pour wet ingredients into dry and mix with a wooden spoon. In batches, roll dough out between parchment paper until 1/4″ thick. Use cookie cutters to cut out shapes. 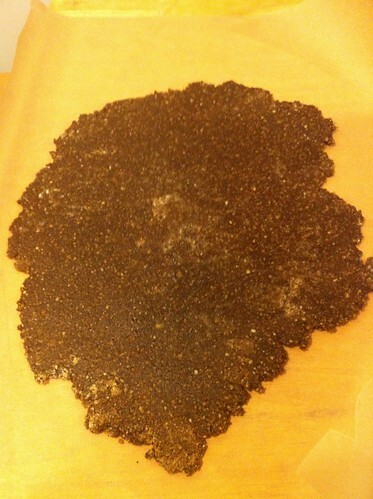 Transfer to a cookie sheet lined with parchment paper. Bake for 8 – 10 minutes. Let cool and decorate! 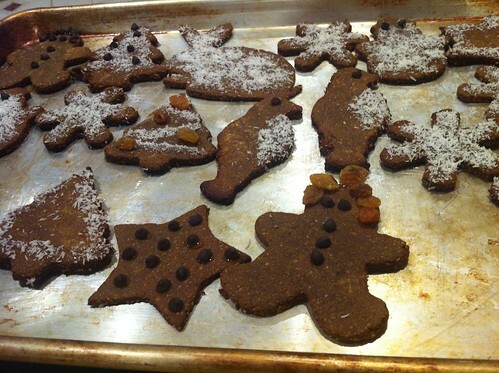 I used honey, coconut shreds, dark chocolate and raisins, but any combination of dried fruit would work too.